Chemical engineering professor Frank Morton had some very good ideas – perhaps because he left school aged 14 and worked his way through night school and then university to achieve global recognition for his dedication to future generations of chemical engineers. Frank was also distinguished by his care for the sporting and social side of his students’ lives (see my blog ‘Work hard, play hard‘ for the 2015 Frank Morton sports day). So, sharing this dual perspective, Professor Redhouane Henda of Laurentian University in Ontario, Canada, is a very worthy winner of the 2014 Frank Morton Medal for excellence in chemical engineering education. I’m sure we all remember good teachers on our way to becoming chemical engineers. Redhouane’s commitment to education goes far beyond lecturing in the classroom. He founded the Laurentian University Chemical Engineering Chapter in 2006. This helps chemical engineering students organise their academic and social activities in a coherent way. He is still an advisor to the Chapter. Redhouane has also developed computer modules as educational tools, to help students better learn some of the non-trivial concepts that chemical engineering can throw at them. And he developed a laboratory experiment to help students engage with the concept of simulation/analogy in chemical engineering modelling. Both the computer modules and the lab experiment have been recognised for their innovative power. Collaboration with peers to create new courses and develop existing ones in another important facet of Redhouane’s work. While he was on the faculty of the United Arab Emirates University, he served on an interdisciplinary teaching team focused on strengthening mathematical skills in the chemical engineering curriculum. At King Saud University, he coordinated the cooperative summer training programme, and served on a steering committee for a major review of the chemical engineering curriculum. While in Saudi Arabia, Redhouane also co-instructed an intensive workshop on engineering materials for employees of Saudi companies around Riyadh. Similarly, in Sweden, he has lectured with a Swedish colleague in an intensive workshop for graduates and professionals from Swedish companies, focusing on advanced process simulation. Since arriving at Laurentian University in 2001, he has chaired the committee for establishing chemical engineering teaching labs, as well as teaching over 15 core courses to students in chemical engineering and other engineering programmes. Redhouane has contributed to the development of the global chemical engineering profession through his writing and editorial work. He is co-author of the textbook Principles of Chemical Engineering Processes, which was recently published in French. Redhouane has also been busy, as an Associate Editor and then Editorial Consultant, for IChemE’s own journal Education for Chemical Engineers. Recognition has come from around the globe for Redhouane’s work in education, as well as his specialist research areas: nano-science and nanotechnology as it applies to the fabrication and characterisation of thin solid films for energy intensive applications; and process engineering aspects of modelling, based on first principles, along with computer simulation of chemical and physical systems. But for such a dedicated teacher, to be awarded the Certificate of Appreciation by the Student Success Centre at Laurentian University in 2012 must have been a particular highlight. I am delighted that Redhouane can now add the Frank Morton Medal to his many exceptional achievements. 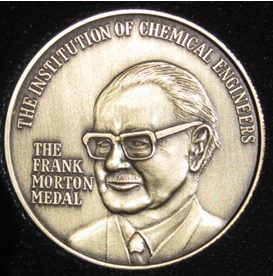 You can find out more about the Frank Morton Medal, and other IChemE medals here. Redhouane sounds a great guy. I hope that he is more inspiration than Frank Morton who frankly never impressed me as a teacher. Maybe I just missed the point.